Historically, significantly fewer Americans vote in midterm elections than in presidential elections. Which might lead you to believe that midterm elections are not much to be excited about. But this year, a high-powered microscope is hyper-focused on a single segment of the population that may decide the entire election: women. Whether it’s Elizabeth Warren (D-MA) campaigning for Senate candidate Natalie Tennant in West Virginia, or Ann Wagner (R-MO) fighting to win seats for more Republican women from states across the nation in the House of Representatives, women voters and female representation are certainly on the brain of a wide variety of politicians seeking election. According to a new poll released in a recent Time magazine article, the 2014 midterm election’s outcome depends on which side can capture the votes of the most women. With issues of equal pay, as well as access to reproductive healthcare and abortion, on the table, female voters certainly have cause for activation during the 2014 election season. I don't think there's any one reason I can point to for continuing to work on campaigns. It's very fast paced and unpredictable, which I like. I also really enjoy both the people I work with, and the candidates I work for, so there's almost a social aspect to it as well. And of course, I feel very passionately about electing candidates who will work for a progressive agenda, so there's also a piece of it that's based on the values that I want my community to be governed by. Hubdialer isn’t the only political software students are using on campus. This year, for the first time ever, Wellesley students were able to utilize TurboVote, an online service that allows students to register to vote and apply for absentee ballots online. The Committee for Political and Legislative Awareness (CPLA), a subset of College Government, organized a voter registration and absentee ballot drive in September. According to CPLA Chair Beth Feldstein ‘15, 59 students utilized the in-person drive to access voting resources, whereas 75 people signed up using TurboVote. Beth’s work with elections on campus is far from done. On November 4, CPLA, along with the Wellesley College Republicans, the Wellesley College Democrats, the Knapp Social Science Center, the Wilson Fund and the Schneider Board of Governors (SBOG) are hosting an election night party. Beginning at 7pm in the Knapp Atrium, the celebration will bring together students from a wide variety of political backgrounds. 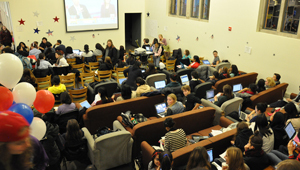 Students can congregate in either partisan or bipartisan areas to watch election results come in.